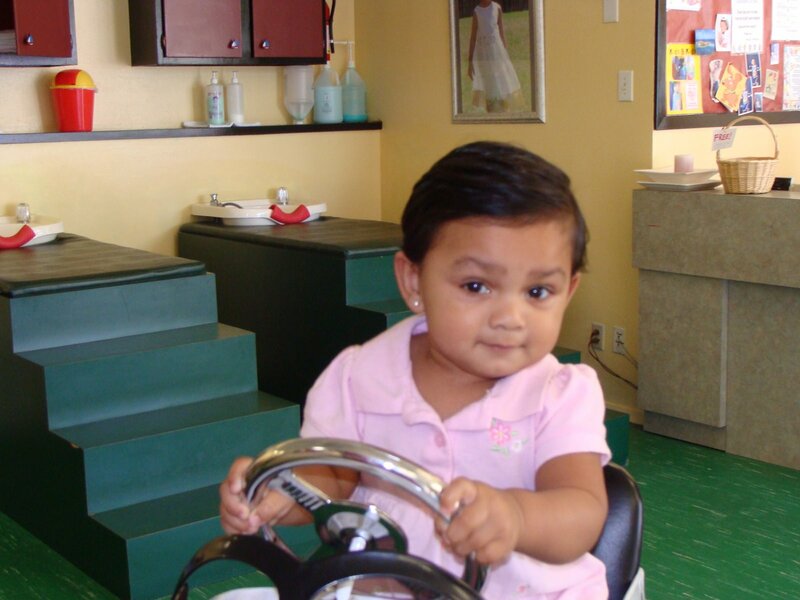 Aadya got her first hair-cut on May 3rd. She always had long strand of her,falling into her eyes.And everyone kept telling me to cut it off or pin it up,away from her face. It used to irk me so much. Coz,I just didn’t have the heart to cut it off and there was no way,I could pin it up. Aadya has really soft and silky hair.My mother always had trouble taking care of my hair.Even now,my hair is clumsily set.I mean I style it and in no time,it slip out. Same is the case with Aadya. And if someday,the clip remained in its place,this brat would pull it off and push the hair back on her face. So, they kept telling me..people I mean, friends,neighbours, family..everyone and I just never wanted to cut her hair. until 2 days back. Friday morning I woke and saw that her hair looked really unruly.. but I was promptly distracted by her crying and spent the day carrying her on my hip till my left arm gave up. Saturday morning,May 3rd,I woke up fresh and realised that the hair indeed was grown and need to be tackled. I sat down with her in my lap,hair brush,et al,tried combing -no change. My decision was made.I knew I had to take her for a hair-cut and soon.. lest i change my mind. When I asked the Dad ,he,more than willing agreed..because he was from the other club. He even asked me cut her hair off MYSELF!! Yeah right! Anyway, we went to this kids salon,after her nap.We had to wait for sometime,the father daughter got busy playing with the train set.As the sister pointed out later,the Dad was more excited than Aadya. He looked like a kid in a toy store,while Aadya,sat primly on her little yellow chair. When our turn came,the stylist asked me to buckle her up in the Cop’s car! And I did. And boy! did she love it. She had a fun time, turning the steering wheel. She sat quietly playing with the wheel,when the stylist snapped on the apron. And after a little discussion about what I wanted done with her hair?Vain Mumma replied..”Oh something cute”..It must have taken every ounce of professionalism for the stylist to not laugh in my face,instead,she told me politely,that there wasn’t much she could do with hair so short,except trim it…Sure go ahead. When I saw about to snip the first curl,I almost wanted to stop her…but then,the Dad and the Sis were looking at me,as if warning me to behave!So,snip snip snip,went the stylist..while I watched amazed. And then,I realised belatedly,that Aadya,didn’t cry. I have heard it from so many moms,that babies hate their first hair-cut. So many friends had told me horror stories about kids biting stylist or not being to fidgety and upset. Even the stylist warned me that Aadya might not let her cut her hair. But,this little dame,sat quietly- she did let out a couple of oh-oh’s when the hair was cut. Even the stylist was impressed. Then, as we paid and collected a certificate and the first curls, Aadya and Chichi played by the train table. And when the time came to leave, a huge melt-down happened. The little Missy just didn’t want to leave! Ever heard of a kid,who doesn’t want to run from the place,when she got her precious curls chopped? Anyway,she was hugged and pacified,and we left. After that,whenever,munchkin caught anyone,looking at her, she would touch her hair and smile..as if to say,”Look I got a hair-cut”! I leave you with a picture of the new hair-cute..uh cut I mean. Prim and proper is what she is…very pretty! I am waiting for Naren’s tonsure ceremony…knowing fully well that he is gonna cry his heart out! OMG she looks like a little rosogulla..makes me want to nibble her cheeks..isnt she looking all lady like and pretty?! Swati- I know wouldn’t that be cool. I thought they had something like that in shoppers stop.May be something else.Shobana- Thanx dearie..I wish there was someway to distract him,during the ceremony.Imp’s mom- welcome.Li’l munchkin wants to comb her hair herself too.. Makes them feel grown up i think.Meira-welcome and thanx for the compliments and wishes.RV- yes, i think her cheeks look rounder after the cut too 🙂 ohh you should have seen her, acting all lady-like..showing off her hair-cut. ha ha ha ! nice.. u look soooo adorable sweetheart… lets go on a date now ! found you finally..and ofcourse since I get to see her live…u know I think she looks adorable, so there!! Oh my, she looks ADORABLE! :)The first haircut i remember, I was 4. Lying on a soft foam bed while someone washed my hair so nicely i fell asleep, and then being woken up by Ma, watching Barney while she cut my hair. Luxury!Hey, why don’t they do these things for us “grown-ups” too?